The Kurdish armed force Peshmerga has launched a program called F.R.A.M.E (Foreigner Registration Assessment Management and Extraction program) aimed at recruiting American and British ex-military men to fight the Islamic State. Peshmerga has created a website with an application form for potential volunteers in order to make the recruitment process easier. It also provides information as to exactly what the applicants would be doing in Kurdistan (an area on the border of four states: Syria, Turkey, Iraq and Iran) if accepted. The site also gives the Peshmerga an opportunity to examine the background of the candidates and make sure that they are not connected with the IS. The F.R.A.M.E program’s website describes the selection process, provides candidates with necessary travel information and contains an outline of military service in the Peshmerga. At first, volunteers must fill in an online form which, among others things, requires them to befriend them on Facebook, describe all prior military service experience and list any medical, allergic or psychological conditions. After confirmation of the candidates, the Peshmerga contacts the servicemen via telephone to become better acquainted with them and to better understand their intentions. If a candidate meets the requirements, they are provided with all necessary information concerning travel documents, flights and even reimbursement for airfare. According to the F.R.A.M.E. website, when a candidate arrives in Kurdistan, he is picked up from the airport by American or British volunteers and transported to barracks. There he will spend a week getting use to jet lag while getting training and obtaining weapons. They ensure potential volunteers they will be able to maintain contact with their family during this time. After this, the Kurds decide in which unit the volunteer and his skills will be useful. The Kurds also emphasize that there is an important rule – there must be at least two volunteers in one unit. The Peshmerga says that foreign recruits can stay with them as long as they like, but not less than a month. Kurds also warn the applicants that they are thankful for their willingness to serve, but do not tolerate dishonesty and unprofessionalism. Kurds have recruited American ex-soldiers before, but the process is reportedly better organized now. Jordan Matson from Wisconsin, 28, joined the Syrian Kurds last year. “We are what stands between life and death for those behind us. Those who simply want to live in peace. When governments are unwilling to stand for what’s right,” he posted on his page in Facebook page, explaining his decision to serve. He also helped Kurds to recruit more volunteers. Evil men prosper when good men do nothing. For those of you that made your way here. When the days get long and...Posted by Jordan Matson on 4 Апрель 2015 г.
American volunteers say that despite all efforts still it is not easy to travel to Kurdistan. “When I arrived they were giving me a hard time at the airport because of all the gear I had brought. So, I lied. I flashed an old reserve ID I still had and told them I was on orders. It worked. That was three weeks ago,” a former US Marine told popularmilitary.com. Another one was stopped by the FBI at a Chicago airport. 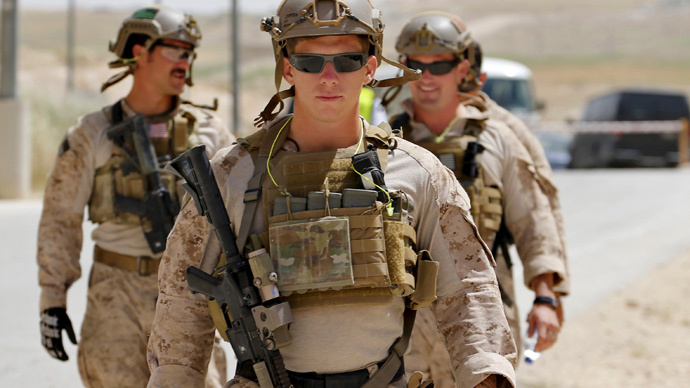 He was wearing a US Marine Corps globe and anchor on his body armor and did not reveal the name of his unit. “They took my body armor and asked me a few questions. I don’t know how they knew I was coming, but they did,” he said. The Peshmerga is fighting the Islamic State jihadists in Iraq. They managed to liberate the city of Tikrit in the country's north with the help of Iraqi government troops and support of US-led coalition airstrikes. In January Peshmerga fighters helped the Syrian Kurds from the YPG - the Kurdish People's Protection Unit - to retake the town of Kobani on the Syrian-Turkish border. Historically Kurds have populated parts of Turkey, Iraq, Iran and Syria. They have been trying - though without success - to establish their own state since 1890s.